Ios has 32 magnificent beaches all with wonderful golden sand and turquoise coastlines. Lovers of the sea will be enraptured by the superb beaches of Ios, some of them busy (such as Milopotas, near Chora), and others no less attractive but much quieter (Agia Theodoti, Psathi, Kalamos, Plakes, Kolitzani and Manganari). Ios has regularly been voted in various polls as having one of the "Top 10 beaches in Europe" and it in fact boasts 75 kilometres of beautiful, white sandy beaches and turquoise coastlines. Yialos is located at a few minutes walk from the Port, at the end of the road which follows the bay of Yialos. It is a very popular beach. Its fine white sand and crystal-clear waters are really enjoyable. The beach is surrounded by restaurants, cafes and mini markets. Yialos beach also offers water sports facilities, as well as scuba diving and a nice beach bar. This little beach tends to get rather-unfairly overlooked, but is very handy for Port Ios, being within 20 minutes' easy walk, past the church on the left headland. There is a taverna which supplies fixed parasols and loungers. The swimming is perfect for snorkeling and scuba diving. It is in a small cove on the headland between the port and Mylopotas. Along the way to Mylopotas from the village you turn right off the road and go down a concrete road. There is a small sign beside the road. The sea is clear and easy to get into, beautiful pure sand, gently shelving into the water and sheltered from the wind is one of the more suitable places for scuba diving. Tzamaria is located between Yalos and Koumbara beach, it is a nice and quiet sandy beach. Perfect for snorkling and scuba diving. Koumbara is in a beautiful bay at a 30 minute walk north-west of the Port; it can be also reached by bus. It is a 300 metres long sandy beach, a very quiet place, undisturbed by the noise and the big crowds of tourism, ideal for swimming into clear shallow waters, cliff dive along the Ios rocks and scuba diving. Koubara’s pure and soft golden sand is marvellous, but not as much as the astonishing sunsets that can be seen from it. Going from Chora to Agia Theodoti, if you leave the asphalt road and take the path branching off to the left, you'll be heading to the amazing beach of Plakoto. Some meters short of that, there's another path that leads to the ancient ruins dating from the Hellenistic period, where tradition claims that the tomb of the poet Homer lies. Agia Theodoti is reachable by the asphalt road starting from the windmills at Chora or by the road to the rear of the Ormos valley. The bay of Agia Theodoti has a beautiful beach with golden sand and crystalline emerald waters. Local taverns serving delicious Greek food and rooms for rent make the day in Agia Theodoti particularly agreeable. Also on the beach you will find umbrellas and sunbeds for rent. Ruins of an ancient aqueduct and a tower can be seen on a hill above this beach. On the most fertile spot of the island lies the beautiful green valley of Psathi, which offers two wild beaches, still unharmed by mass tourism. Psathi can be reached by the road going to Agia Theodoti, where a religious festival takes place every 29th of August. The two beaches at Psathi have fine golden sand, flat rocks and amazing deep blue waters. Psathi is the ideal place to find peace and tranquillity, in a beautiful, wild and almost deserted environment. Nice taverns and rooms for rent make the stay there easier. This beach is particularly popular among windsurfers during windy days when its waves rise very high. Close to Psathi, there are the ruins of an ancient temple. Kalamos is located on the eastern coast of Ios, following the road past Kalamos monastery, where the most important religious festival of the island takes place on the 29th of August, one can reach the beautiful long sandy beach of Kalamos. It is one of the many beaches of Ios that remains usually very quiet and almost deserted, often offering to the visitor the chance to enjoy it alone. The limpid and clean waters of Kalamos are perfect for a peaceful and reviving swim. Plakes is located on the road from Kalamos which keeps on going south and leads to the remote beach of Plakes, a very beautiful and quiet one with unbelievably clear waters and soft, golden sand. This idyllic hidden cove lies to the south of Kalamos and is an ideal place to relax and enjoy the clearness and coolness of its crystalline waters and the warmness of its golden sand. It is unreachable by car, but in the summer there small cruises that would take you there. Just before you reach Manganari by the dirt road, you see this lonely beach on the left side on the road, there is a little goat path leading to this beach, but the best way to reach the beach is by sea. In Tris Klisies, there is a very small rocky island, which makes the water shining from deep-blue to green. Manganari is the main allurement of Ios island. It is a complex of five beaches gathered together with golden sand and beautiful sea. This enchanting bay is divided into five idyllic beaches with golden sand or pebbles, and shallow crystalline emerald waters. The beaches are suitable for families witch children because of their sequential entrance to the water. In the centre there is possible to put up, visit some of the local pubs or try different kinds of water sports and scuba diving. About 23 kilometres from the Port, on the south coast of Ios, at the end of Mylopotas beach, a road climbs up the hills and turns right before Kalamos monastery to reach the wonderful and almost deserted Manganari bay. Manganari is like paradise on earth and will fulfil every need for relaxing holidays in an incredibly beautiful environment. Taxi-boats and local buses leave regularly from the Port, Chora and Mylopotas for Manganari. South west of Chora, Mylopotas beach, the busiest beach of Ios, can get really crowded during summer. The long sandy beach extends for one kilometre and offers sun beds, umbrellas, beach bars, cafes, restaurants and a great variety of sea sports, including scuba diving. Its emerald waters are a real delight as is its pure golden sand. Mylopotas can be reached by the buses departing from Hora every 15 minutes or by a donkey path. Mylopotas is by far the busiest beach on the island and is where most people spend their day. 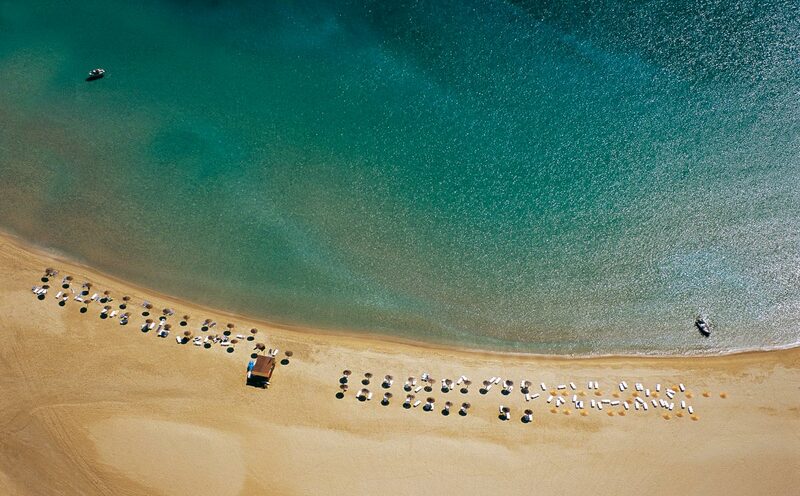 Mylopotas is considered one of the finest beaches in the Aegean.